The good thing about summer is the various cold and refreshing items we can consume . The moment heat rises out come the slushies, granitas,sorbets ices and whatnot. When I was a kid, I knew only very few of these. I could see the roads lined with watermelon and knew then summer was here.Mostly I was happy with the 'sip ups' that where available all the year round and were much needed in summer. But now its gourmet. You get French sorbet, Italian granitas along with Indian kulfis and golas. Anyway recently I tried out slushies. I had heard that name few years back in a board in front of icecream parlour. Which left me wondering what it was. Then as usual I completely forgot about it. Then came coffee & tea lounges "on the rocks" drinks. They too were given up by me. Then I saw an episode of Giada's Italian ice. Finally I found out the slushies, "on the rock" drinks and ices are almost the same. They might differ slightly on how they are prepared, but basically they are ice blended/topped with flavours. I had tried out blueberry slushy/slush/slushie/ice here. Its very simple also. 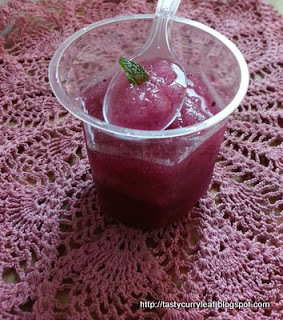 I had blueberry syrup with me which I pulsed together with ice cubes . A simple straight forward recipe. Blend in an ice crusher or chutney jar of your mixer both the ingredients. You can do the taste test and add sugar syrup as well to adjust the sweetness. Serve in glasses garnished with mint along with spoons/straws. In case you want Italian ice, crush the ice, pour in cups, top with syrup. You can go for your choice of syrup not just blueberry.Welcome summer. 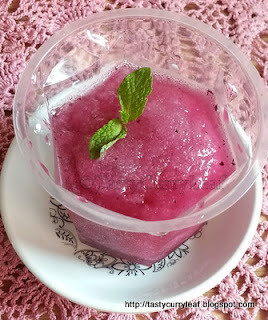 How wonderful that catch blueberry slush, lovely and prefect for hot summer.